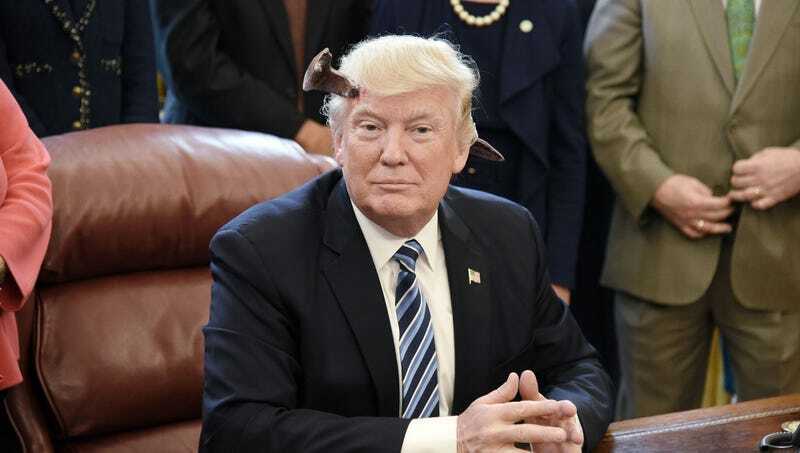 WASHINGTON—Logging countless hours in the Oval Office between warmly greeting foreign diplomats, an unusually serene and well-spoken President Trump was hard at work Thursday, industriously shepherding environmental and civil rights bills through Congress just days after a freak accident left a railroad spike lodged into his skull. “President Trump has been a model of professionalism ever since the accident—he’s attentive and inquisitive during intelligence briefings, articulate at press conferences, and his tweets have been increasingly vetted and thoroughly researched,” said White House chief of staff John Kelly, echoing the general sentiments of staffers in the West Wing, where feelings of general relief and a newfound sense of job security were observed during the two-hour morning meeting Trump convened to discuss naming Ada Limón the new U.S. poet laureate. “At first I was a bit concerned, as anyone would be when a railroad spike pierces a sitting president’s cerebral cortex and bisects his hypothalamus, but the White House physician checked him out and concluded that the benign effect on Trump’s disposition outweighs any possible long-term harm.” At press time, staffers confirmed Trump was growing morose and irritable after banging the protruding head of the spike on the doorframe of Air Force One while attempting to deplane.